Nine years ago Portugal, facing mounting drug use rates and addiction-fueled urban decay, decriminalized all drugs. Trafficking drugs remained illegal but possession of all drugs, including highly addictive and dangerous heroine, could be legally used. The move was intended to encourage addicts to seek medical help without fear of arrest and allow police to ignore personal drug use while focusing on apprehending traffickers and major dealers. The anniversary of this policy is attracting a good deal of media attention– nearly a decade on Portugal’s experiment seems to have worked. Previously decaying inner city neighborhoods are much safer now, drug seizure rates are up 500 percent, and addiction rates have fallen. As could be expected with the removal of the risk of legal punishment for drug use the number of young people experimenting with drugs has slightly risen, but the portion of these experimenters who actually become chronic users seems to have fallen dramatically. After a decade long experiment the policy seems to be a good one- as libertarians have insisted, the small social costs of decriminalizing the consumption of all drugs is far outweighed by the never-ending social and financial price of expensive and ineffectual prohibition. As positive as Portugal’s experience with wholesale decriminalization seems to have been, its hard to imagine the more conservative and religious US taking similar steps in the foreseeable future. Despite America’s self-identification as a bastion of personal freedom truly libertarian policies like narcotic decriminalization are rare here, and barring a major shift in American political ideology likely to remain so. However, public enthusiasm for marijuana legalization is the highest it’s ever been and, because of wide support for legal pot among younger voters, likely to become more so in the future. Individual states voting passing initiatives to legalize marijuana is possible in the next decades, and national legalization isn’t unimaginable. But if Americans do vote to legalize pot and not harder drugs, legislatures will have to decide where to draw the line on the legalization spectrum. If drugs like heroine and meth are, justifiably, too dangerous to decriminalize while pot isn’t where should the line be drawn? Given America’s messy encounters with drug politics this will be a contintious issue. Source: "Development of a rational scale to assess the harm of drugs of potential misuse." The Lancet. Here’s a possible solution. From The Lancet, this figure charts individual drugs’ potential for dependence and physical danger. 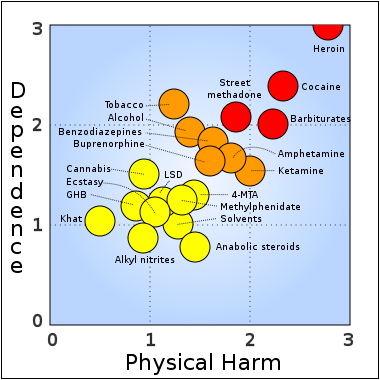 Why not legislate that drugs below 2 on either the dependence or harm scale are safe enough to decriminalize, and the more dangerous drugs above these lines remain illegal? That would allow individuals the freedom to experiment with the drugs that rarely cause permanent harm, saving billion in prohibition costs, while truly horrible substances would remain prohibited. 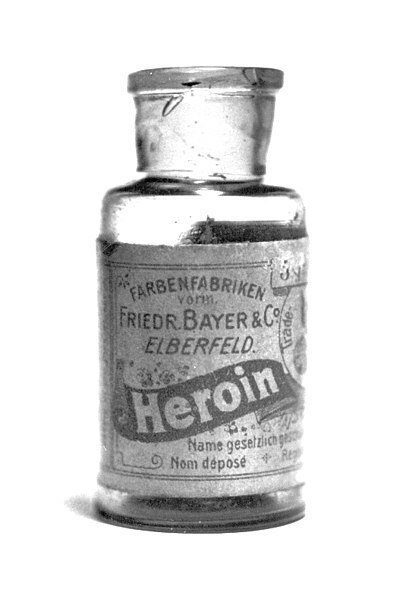 Of course the nearly century-long prohibition of heroine and cocaine hasn’t done anything to keep these drugs off the streets, but this policy would allow the federal government to maintain that these drugs are too dangerous to receive tacit state approval, even if prohibition is billions of dollars more expensive and arguably more socially harmful than decriminalization and well funded recovery programs. There’s one other problem with this decriminalization scheme: if American politicians insist, with good reason, that methadone and barbiturates are so addicting that citizens can’t be permitted to legally buy them then tobacco must be as well, because it’s nearly as addicting as cocaine. So if we want an evenhanded drug policy either tobacco is too dangerous to legally sell, or you should be able to buy hard depressants and synthetic opioids in any gas station. Something tells me we’re in for a long debate before we find an answer. There are both good and bad sides of using marijuana for medical purposes. Although the debate goes on, there are rising numbers of people in Michigan who registered and licenced are taking advantage of medical marijuana. You can find helpful stats and information demonstrating the pros and cons of using medical marihuana for various diseases and pain relief. I thinks it better to legalize and kept under the control of the authorities rather than prohibiting and encourage people to illegal use. I’ve been reading this site for a long time and just decided to stop by and say howdy for the first time. I seriously like reading your posts. See you.